based on these 35 happy customer reviews. Frank and Matt replaced lighting fixtures and hung a very large chandelier with a hundred crystals..they were unbelievable! Electrical Connection should be very proud to have these two servicing their customers .. so friendly and extremely competent. The job they did went beyond my expectations. The scheduling of the job was efficiently handled and promised time and date was exactly as stated. I would highly recommend this company and if lucky Frank and Matt will do the job! I was very pleased with electrician- Frank who visited today to assess the problem with my light fixture. He is most professional,prompt in his arrival time, diagnosed my light fixture issue ,replaced it with a new fixture that I had previously purchased. All his work was done quickly and efficiently. He explained that he tested the light fixture and the settings that were set on it. My rating- A++ service. I have to say.... Frank and Matt were awesome! Frank came out earlier this week to give us a quote to install a new dining room light (and install the wiring as there was no light fixture place there). Both Frank and Matt were out today to install the light and not only did they do an awesome and quick job getting it up and running, but they also made sure I was happy with how the light was hanging, tested it all out, and cleaned up after themselves including sweeping and moving the table back. They were also both just really nice and explained everything to me, and chatted with me while I watched them working. I would most definitely want them back here again for any other work we were having done and because of how awesome they were, we will be using you guys for all of our future electrical work! I just wanted to share how great Frank and Matt were today when they came to install our chandeliers and pendants. They provided info about the best bulbs to use and gave advice on future lighting fixtures we’d like to install. Not to mention, they knew exactly what they were doing and were quick and thorough! Would absolutely recommend these 2 and would love to have them back for any future installations given they’re available! WI live in the rivington @ 4 Winding Ridge Way. I would like to thank Leah for setting up the appt. for me. The two electricians Matt & Frank who were on point. Very clean work. Thank you. I just want to say 'Thank you'. Frank replaced some fixtures for me three years ago and I was happy to see he was the one replacing other lights for me today. He's great to work with; professional, fast, responsive and a great rep for your company. It's always a leap of faith when hiring a company to work with, even after reading great reviews and recommendations from others, and it's a delight when you find that company you want to stay with and whose employees you recognize years later. I can't say enough good things about Frank. I've worked with many companies over the years, Electrical Connection will be the only electrical company from here on. Thanks again for fitting me in, for a fast turn around, and great work. The Jasilli sconce project has been completed by Frank and Matt. I wanted to reach out to inform you of the most wonderful job they did! They thought of other ways to get the job done without cutting into the sheet rock in the garage and it looks awesome! They even cleaned up when the job was finished. Many thanks again to Frank and Matt and thank you Electrical Connections for a job well done! Frank and Matt were here this morning to service our generator and it was a very positive experience all around! Their communication regarding our appointment time was fabulous, they were extremely courteous and polite (and very good with our dog! ), and they did a great job servicing and cleaning our unit. Based on this first experience with your company, we will definitely turn to Electrical Connection for our future needs. I think all too often people communicate with management when things go wrong, and I think it’s important to let management know when things go right. Frank and Matt are definite assets to your company! I should also note that the woman who scheduled and confirmed our appointment over the phone was great too! Always 5 Star Service! Very professional, courteous and knowledgeable staff. We've enjoyed your services for our new heating system, new A/C system, Generac home generator and a number of other service calls we've place to update this old home. Thank you for always being reliable 5 Star service attending to our every need. I just wanted to let you know that Frank and Matt did an outstanding job getting my workshop powered yesterday. The job was very professionally and neatly done. It looks great… from the sub panel installation to all the conduit and receptacles…and I’m really picky about things. Plus, they are all around good guys! Definitely will want them back when the basement is framed in. I'm a new customer. I want to make sure you know how pleased I am with the work done today by Frank and Matt. They arrived on time, diagnosed the problem with the ceiling light in my home office, got a replacement fixture at Lowes, and installed it quickly. We have made two service calls during the last year since moving into our house. Both times a technician named Patrick responded. He was very friendly and professional and arrived when he said he would. He took the time to explain what he found and what he recommended. Even though one call was late at night, he never seemed rushed or irritated as I have experienced with off hours calls with other companies. The previous owners recommended Air Temp and I'm so glad they did because we have been very happy with the customer service so far. The two gentlemen you sent to my house at 71 Ridgewood Drive were outstanding. They worked as a cohesive team taking care of how the hung my chandlers. They were conscious of my floors and I my walls as they worked. The had impeccable manners and they did a great work cleaning up after they were done. What a wonderful team of hard workers you send out to represent your company. I feel you can figure out the integrity of the company by their employees. Hello Scott: A word to thank you and especially your team, made up of Frank and Matt, for the excellent service I received today. Frank and Matt were friendly and cheerful: they enjoyed their work, and above all, first-rate electricians. I am delighted with their work, and I look forward to using your company again, soon. Thanks again. Hi. Frank and Matt came to my property and installed 4 recessed lights and ceiling fan. They came on time and finished the work on time. Their work was done really nicely, so I would recommend this team to my friends definitely. I would like to be a returning customer later. Thank you again for your great work. We wanted to thank Frank Baio and Matt (don't know last name) for the great work and service completed on Wed 8/16/17. We will refer your company to our family and friends. Just wanted to let you know what a great job Frank did this morning. his detail, attitude and kindness were much appreciated. Hi - I just want to let you guys know that Frank and Matt did an outstanding job at our house today. They were prompt, friendly, and professional. We will use you again for future electrical work. I wanted to enthusiastically write to you to commend your guys, Matt and Frank, for doing an absolutely superior job on my fixtures install this morning (Timber Oak community in Danbury). The guys just left a few minutes ago, and I was so pleased with the experience, I wanted to write to you ASAP. Not only were they both super personable and polite, but they completed the jobs much faster than I ever imagined. They were beyond professional, cleaned up after themselves, and were awesome about getting everything "just so" to my liking. They brought in the huge 20' ladder for the foyer fixture install, and were awesome about completing a difficult fit without doing the slightest bit of damage to the floors or wall. I can't thank you guys enough for the service. Our neighbors, Frank & Dorothy, used your company late last year and I'm glad I reached out for our needs. I'm more than happy to leave several reviews on social media to reflect my happiness with the job, including some of the local Bethel forums and our community FB page as well, recommending Electrical Connection. Thanks again, and please make sure you pass along my sincere appreciation to your team." "Excellent Service!!! Appreciate your ability to acommodate our service in such a quick and timely manner. Your technician was very professional and respectful of our home. All work and communication was the highest level. Thank you!" "Last night I had a large tree branch fall on to the wires from my house to the pole on the street. The large pipe above the meter box snapped and the wires were downed. Within 45 minutes of calling Electrical Connection I had a service technician at my house. Sam Z. explained what needed to be done and assured me the job would be completed without a problem. A short time later Tony showed up and the two completed the job in a very professional and timely manner. Their knowledge and experience was very evident. Both of them were also very customer service oriented. Thanks for the help, glad I called your company. PS, Tony is the best dressed electrician in the business (inside joke!!) Thanks again." "I liked the customer service rep. She was so friendly and happy to help. The electrician was very up front about costs and also was very good at explaining problems." "Electrical Connection installed a transfer switch for our generator last year when other companies would not even return our calls. The work was professional, friendly and efficient. This year we called to have an outlet installed on our deck and a junction box for our new motorized awning again great friendly service. WOULD NOT CALL ANY OTHER COMPANY !!!!!" "Arrives within the time frame given. Work was done professionally and multiple options were given for how it will be completed." "You and Electrical Connection have been so good to us, since we purchased this home over 3 years ago! From the very beginning with Larry Wood to our recent ..fantastic experience with Scott White, we have and will continue referring you to anyone in need of your services. I know we still have several more projects to complete this year and most likely into the following year, so we look fwd to having you over again soon. Thanks again...you guys are the BEST!!!!!" "Customer service was great and we got a prompt reply and scheduling of the job. Scott was very professional and we felt like the job was done right." "I am very pleased with the service I received from Scott, who worked on my Service Upgrade, Bill who did my generator install, and Marcy who is always helpful in assisting me with scheduling appointments. I picked the right company for the job." "The service turned out fine. The young man that came was very nice. He was careful and very pleasant." "As a subcontractor to Banton Construction, Electrical Connection has always been a pleasure to work with. From the office staff to the electricians on site they have been extremely professional, reliable and well organized. I would recommend Electrical Connection for any electrical work required whether residential or commercial. "Randy was here this morning to set up our Alarm System. I have to tell you, he is one of the best tradesmen I have ever encountered. His knowledge is unbelievable and his mannerisms, attitude, personality and professionalism are second to none. You are blessed to have someone like him on your staff. Not only does he represent your company in the best light possible, he also shines bright on Toll Brothers! Thanks again! You will always get my endorsements." "I once again wanted to pass along a good word regarding Bill. He installed an exterior light on the Avon construction office today. Very professional and neat installation. You've got a good guy in your service department!" "I am writing to tell you what a rare find you have in Randy Serkey, and how lucky it is that you have him working for you. I called Westminster Alarm Company to finally set up our alarm system. I was told that a technician would call me. He did, it was Randy. Randy and I set up a date and time in which he would come and reconfigure the alarm set up and get it up and running. When I came home from work at 3:15, when Randy should have finished, my mother said there was a problem. Of course, this was no surprise to me because I have had problems with the wiring system in the house since we moved in. When I had cable come in to install the boxes for the television, there were issues. When the telephone company came in to set up the phone lines, there were issues. So naturally I took this as another inferior installed system. Not to make a long story longer, but there were issues and poor Randy stayed in my house until 7:30pm from 12 noon to rectify all the problems. To put it succinctly, the command box wasn’t where it should have been but placed in the laziest and most convenient place for the original installer in the loft, when it should have been by the electrical box in the basement. Connectors were dummies, there was nothing to set off the alarm should an intrusion have occurred if the system was running. The wires were so short that when they were cut when originally installed, Randy didn’t have enough play to work with them to cut them and reconfigure. These are just a few of the items that Randy fixed. The bottom line is that Randy stayed in my house to do a job that was better than good. He never looked at his watch, never bemoaned the fact that it was past his dinner time with his own family. He didn’t hurry up and just change the alarm key pads and let that be the end of it. He would not leave until all connections and the test run was finished. Randy never took a break; he answered each and every one of my questions as I followed him and asked what this was or what that was. He answered courteously and with great knowledge of what his business is. It is a rare person who takes such pride in making sure his job is done to perfection and perfection it was when Randy was finished. I give countless accolades to Randy and hope that his position at Electrical Connection is appreciated and compensated." "I just wanted to take the time and thank you for the wonderful work and the great service that was provided by your company for a great price. Your staff at Electrical Connection was professional, courteous and worked diligently to finish the job. Our home now looks amazing with all the new lighting you recommended for our bedroom and kitchen area. We have received so many compliments from family and friends and look forward to entertaining our guests." "My wife and I are pleased with the quick response time and quality workmanship your team provided in installing the electrical panel, hard-wired connections and back-up generator to our home during the October storm that left many in this area without electrical service for over a week. You had been highly recommended by one of our neighbors who had recently had some work done at their home, and it is very obvious why they held you in high esteem. Others within the neighborhood had opted for the cheap and unsafe method of plugging in a generator directly to their appliances; a method cautioned against by the local power companies as hazardous and presenting a potential shock risk to lineman. The installation provides peace of mind and a sense of security to my wife and me should we lose power again during the cold winter months. We would be happy to recommend your professional service to others! Please give our best regards to Debby and your Service Manager, Larry Wood, with whom we worked directly." "The service provided by Electrical Connection, Inc. to our home was great. A service call was placed for a repair on our bathroom fan and within hours the work was completed. The technicians were very friendly and professional in our home and made adjustments to fit my family’s schedule so we would not be inconvenienced. We will definitely be calling Electrical Connection, Inc. again in the future." "I would recommend Electrical Connection to anyone based on my past positive experiences. The fast professional and responsive team, were there for me for larger projects and small emergency jobs. They handle all of my needs, all with being priced fairly!" 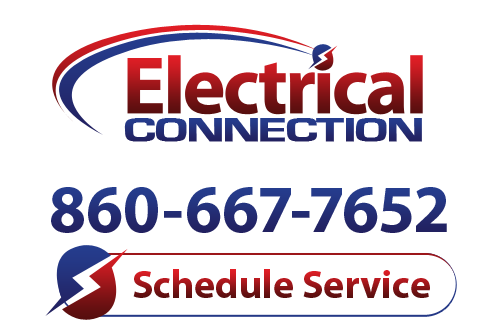 If you are looking for a Hartford electrician then please call 860-667-7652 or complete our online request form.